Not like anyone went to the trouble of revealing the 2009 Audi Q5 un-officially, but the point is the wraps have now come off the new Small-UV from Auto Union this morning ahead of the live reveal at this week's Beijing Motor Show. What more is there to say about this overgrown jellybean other than the press release below the jump? Audi says the Q5 gets "slim, coupe-like styling." We're of the opinion that just because a vehicle is marginally slimmer and more attractive than a Q7 doesn't allow you to claim "slim, coupe-like styling." So, if you believe they're spot on — then go ahead and hit the jump because you'll believe just about anything. The new Audi Q5 combines the dynamism of a sports sedan with highly variable interior and versatile options for leisure-time and family use. Strong and efficient engines, quattro permanent all-wheel drive and agile running gear have been brought together to create a superior technology package for both on- and off-road driving. Highlights such as the innovative seven-speed S tronic dual-clutch transmission and the Audi drive select control system are proof of Audi's Vorsprung durch Technik. The sportiest SUV in its class is dynamic, multifunctional and comfortable. The dimensions alone indicate that this is a SUV of all-new proportions. Measuring 4.63 meters (15.19 feet) long and 1.88 meters (6.17 feet) wide, the Audi Q5 is just 1.65 meters (5.41 feet) high - making it sportier than any of its competitors. What's more, this SUV sets another benchmark in its class with a low drag coefficient of 0.33. With its sporty elegance and artfully sculpted forms, the design of the Q5 is perfectly in tune with the character of Audi as a brand. The front end is dominated by expressive headlights on both sides of the large single-frame grille; on request, they can be outfitted with bi-xenon lamps and LED daytime running lights. Viewed from the side, the large wheels and rising edges are especially prominent features. Crowned by a railing, the elegant slope of the roof underscores the slim, coupe-like styling. At the rear, the wraparound tailgate - made from aluminum just like the hood - clearly identifies this SUV as a relative of its older brother, the Audi Q7. The taillights are available in eye-catching LED technology as well. Audi offers three different options for the external trim of the Q5 - black (standard), contrasting color or full paint finish in the color of the car. Two body packages are available as well. The S line exterior package imparts a decidedly sporty look to the performance SUV, while the alternative off-road style package with underbody protection in the front and back and 19-inch wheels gives this SUV a robust flair. At 2.81 meters (9.22 feet), the wheelbase is the longest in its segment - creating a roomy interior on board the Audi Q5. The vehicle comfortably accommodates five persons in ergonomically designed seats that can be flexibly arranged. The backrests for the rear seats are angle-adjustable and especially easy to fold down by activating the remote release lever in the luggage compartment. This compartment, offering access to a second storage area under the floor, then expands from 540 to 1,560 liters (19.07 to 55.09 cubic feet) in volume. Optional extras include a rail mounting kit for luggage, a net partition and a luggage compartment liner. The Audi Q5 is a multi-talent for sport, leisure-time and family activities. As an option, Audi offers the "rear bench seat plus", which slides 100 millimeters (3.94 inches) lengthwise to provide a load-through facility. The front passenger's seat can be outfitted with a folding backrest for transportation of long objects such as surfboards. Numerous practical storage compartments, drink holders, bottle holders and onboard power outlets are supplied ex works. On request, Audi even offers a climate-controlled drink holder to keep drinks hot or cold. The optional storage package features another clever detail as well - an attachment point in the passenger-side footwell to which various storage fixtures can be attached. Top-of-the-line safety equipment is a matter of course for Audi cars. On the front seats, the belt force limiters and airbags work together in a new and especially intelligent manner. Much of the body of the Audi Q5 is made of high- and ultra-high-strength steel components assembled with maximum precision. They reduce weight while at the same time improving crash safety as well as rigidity and vibration patterns. The Audi Q5 employs design elements typical of the brand in the interior, but adds its own unique variations - the driver-oriented cockpit is set higher, for example, in keeping with the upright sitting position. The ergonomics are exemplary, boasting the uncompromising craftsmanship one expects from Audi - a little treat for the senses in terms of look and feel. The clear-cut interior takes on even more charisma with fine materials such as aluminum, exclusive woods, chrome, leather and Alcantara as well as a large selection of optional design packages. The Audi Q5 comes standard with an electromechanical parking brake, an intelligent chip key, a climate control system and a display screen in the instrument cluster depicting, among other things, the recommended ideal gear for efficient driving in the given situation. A large, central monitor is part of the standard equipment as well. When an onboard navigation system is added, many of the controls are shifted to the MMI panel on the center console. This is the next generation of the best operating system on the market - with even more intuitive graphics and control via the large rotary pushbutton. The Audi Q5 is rolling off the production line in three engine variants - one gasoline engine and two TDI units. All of the engines are direct-injection models with a turbocharger - characterized by outstanding performance, hefty propulsive power and cultivated running while at the same time offering impressive fuel efficiency. The 2.0 TFSI has been entirely redesigned. The four-cylinder engine unites three high-tech features - turbocharging, gasoline direct-injection technology and the innovative Audi valvelift system for variable control of valve lift. The high torque of 350 Nm (258.15 lb-ft) is available at 1,500 rpm and remains constant up to 4,200 rpm, with performance peaking at 155 kW (211 hp). 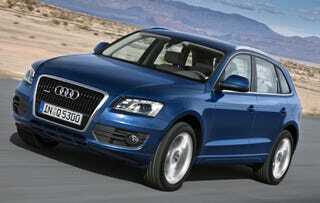 The Audi Q5 2.0 TFSI sprints from 0 to 100 km/h (62.14 mph) in 7.2 seconds, reaching a top speed of 222 km/h (137.94 mph). On average, the vehicle consumes just 8.5 liters of fuel per 100 km (27.67 mpg). Drawing on four cylinders and two liters of displacement as well, the 2.0 TDI is superbly refined thanks to a new common-rail fuel injection system; like the gasoline engine, it has two balancing shafts. With 350 Nm (258.15 lb-ft) (between 1,750 and 2,500 rpm), this diesel engine delivers strong propulsive power at an outstanding 125 kW (170 hp). Average consumption of just 6.7 liters per 100 km (35.11 mpg) is proof of Audi's successful efficiency strategy. The two-liter TDI catapults the Audi Q5 from 0 to 100 km/h (62.14 mph) in 9.5 seconds, peaking at a top speed of 204 km/h (126.76 mph). The most powerful engine in the line-up is the 3.0 TDI. This V6 diesel engine delivers a gratifying 176 kW (240 hp), with 500 Nm (368.78 lb-ft) of torque available between 1,500 and 3,000 rpm. With outstanding power flow and cultivated sound, it takes the Audi Q5 from 0 to 100 km/h (62.14 mph) in 6.5 seconds, accelerating to a top speed of 225 km/h (139.81 mph). On average, the three-liter engine consumes 7.7 liters of fuel per 100 km (30.55 mpg). Just like in the new Audi A4, pronounced the best midsized sedan by the trade press, the position of the component units in the drivetrain has been altered in the Audi Q5 - the differential is located in front of the clutch, directly behind the engine. This solution, which made it possible to move the front axle much further forward, creates a long wheelbase and optimum distribution of axle load. It is precisely these features from which the Audi Q5 derives its unique strengths - good directional stability, high comfort and impressive dynamics. The pioneer of all-wheel drive, Audi builds the Audi Q5 standard with quattro permanent all-wheel drive - the only logical solution for a dynamic SUV. In normal running conditions, the transfer case distributes the power to the front and rear axle in a 40:60 ratio for a rear-focused style that enhances driving pleasure. When needed, the quattro driveline can deliver up to 65 percent of the power to the front axle and a maximum of 85 percent to the rear axle. The running gear in the Audi Q5 further emphasizes its sporty nature. The five-link front axle and trapezoidal-link rear axle are made primarily from aluminum, the steering box below directs the steering impulse directly to the wheels. Large brakes ensure high retardation. The vehicle comes standard with 17-inch lightweight forged wheels in size 235/65. Audi offers even larger wheels of up to 20 inches in diameter on request. The new performance SUV from Audi is sportily precise, spontaneous, safe and comfortable at the same time. Its electronic stabilization program (ESP) has been re-designed and enhanced with innovative functions not available from the competition. A sensor "tells" the ESP if a roof rack has been mounted, causing the Audi Q5's center of gravity to be shifted higher in keeping with the roof load of up to 100 kilograms (220.46 pounds). If a roof rack is present, the ESP engages earlier in the handling limit. Without a roof load, the driver is free to tap the full dynamic potential of the Audi Q5. The Audi Q5 is suitable for all purposes and driving surfaces. Capable of towing up to 2.0 tons, this powerful vehicle delivers excellent performance in rough terrain as well. The standard hill descent control system makes it safe to navigate down steep inclines by regulating the preselected speed when driving at under 30 km/h (18.64 mph). The ESP and its sub-function, the ABS, have special ranges for off-road driving. The ESP focuses on achieving maximum traction in off-road driving; the ABS automatically recognizes the consistency of the driving surface and selects the ideal strategy for sand, gravel or loose rocks. The numbers speak for themselves: The Audi Q5's climbing capability of 31 degrees of incline is exceptional. The overhang angle is 25 degrees thanks to the short front overhang. The ramp breakover angle, determined by the wheelbase, is 17.5 degrees. Ground clearance is an impressive 20 centimeters (7.87 inches), with a fording depth of up to 50 centimeters (19.69 inches) when driving through water. A large package of high-end technologies makes the Audi Q5 driving experience even more fascinating. The optional control system Audi drive select guides the operation of various technology components and is available in several upgrade variants. At the touch of a button, the driver determines whether the system should work in a comfortable, an especially well balanced or a sporty mode. The MMI operating system offers a fourth mode, which can be individually programmed. Audi drive select is available with two innovative components. One is an electronic controller for the shock absorbers, the other is Audi dynamic steering. Outfitted with a superposition gear, it continuously varies the steering ratio and the power steering assistance depending on the speed driven - which means less steering effort is required when parking, and firm steering with low sensitivity at higher speeds. At the handling limits, the dynamic steering stabilizes the Audi Q5 in conjunction with the ESP by means of instantaneous steering interventions. The new performance SUV from Audi is rolling off the production line with a generous range of standard equipment including an audio system with eight speakers. A highly contemporary modular system of components is available for multimedia options - the highest upgrade level features a Bluetooth telephone, a DVD drive, a TV tuner, an intelligent speech control system, an iPod interface and a top-of-the-line sound system from the Danish specialists Bang & Olufsen. The excellent navigation system boasts a high-resolution monitor for new, three-dimensional representation of maps. The hard disk from which the system reads can also save music files in MP3 format. On request, the Audi Q5 comes with a spectrum of high-tech, onboard systems taken directly from the premium class to make driving an even more superlative and relaxed experience. These include the Audi parking system advanced with rearview camera, Audi lane assist (the lane departure warning system) and Audi side assist, which warns of hazards when changing lanes. Adaptive cruise control maintains a constant distance between the performance SUV and the vehicle in front. Additional high-tech extras for the Audi Q5 include the advanced key for keyless access to the vehicle, a tire pressure monitoring system, the large panoramic glass sunroof with additional tilting function, the triple-zone climate control system, sun blinds for the rear side windows, the dynamic cornering light system known as Audi adaptive light, an electric tailgate and a swiveling trailer hitch. The high-beam assistant automatically switches between the high and low beams. On request, the front seats can be electrically adjusted, heated and ventilated - Audi offers the extras from the luxury class in its new performance SUV here as well.